We are an art institution (set up in 2006) that supports art, artists and the development of both and promotes the value and positive impact of art on communities. We specialise in the collection of contemporary art, the production of exhibitions, events and educational initiatives, and provide artists’ studios and artisans' workshops. Q. Who are you funded by? V22 is based upon a unique shared ownership model, which aims to be sustainable, self-sufficient, and therefore independent. V22 has a diverse range of income: from its collection being listed on the ISDX-ICAP market, income generated from studios, and the support received from grant bodies including Arts Council England. Q. I see you have three other studios in London including Dalston, Haggerston and Bermondsey - all known as creative hubs. Did you recognise something similar in SE23? Why did you decide to open in Forest Hill? Traditionally, studio providers have been part of the archetypal regeneration cycle: studio providers by nature generate low income and are then consequentially priced out as they help to make areas more creative and attractive. This is a cycle we have been working incredibly hard to break free from by acquiring long-term leases and permanent buildings. In this particular instance, we were lucky enough to be recommended Louise House by Arts Council England, who told us it was being put up for tender. We applied and won, and were so (and still are!) 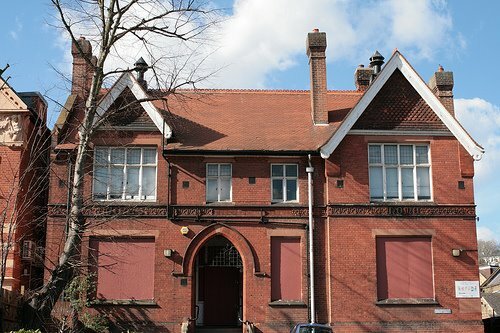 delighted, not only to have the opportunity of having a long term lease, but to have the guardianship of a very special building located in an incredibly active and creative community. These factors we believe will really help to build a strong community and cultural centre. We want to provide affordable long-term studios and encourage the creation of new relationships and networks amongst artists and creative organisations locally and nationally. Forest Hill is a great place to do this. Q. When will you officially open at Louise House? We hope to open the studios during early spring, although there is still some building work that needs to be done before that can happen. The public space at the back of the property we will be working hard on to get the first tentative things happening there in time for the summer. Then there is work needed on the gardens as we have some great plans for them. So I suppose the grand opening will be something we work toward, hopefully in partnership with many local people. Q. What exhibitions are you currently planning for Louise House? We are in the research and development stages of planning our summer programme, presenting a series of events in collaboration with artists and local groups and communities. We also we hope to launch a new educational initiative called Studio+ which will support young and emerging artists. Q. What is planned for the community space? Firstly there will be a dedicated exhibitions and events space integrated into our educational initiatives; secondly a 'Community Studio' which can be used for a variety of activities ranging from art lessons, to workshops, to rehearsal space; and thirdly, a community garden which we would like to build in partnership with people from SE23 and which can be used for summer events and activities. We are yet to gain access to the lower ground area, but we hope this will make an excellent screening room (everyone in Forest Hill wants a cinema!) and hopefully a space which can also be used for theatre and possibly live music. An abundance of creative independent initiatives; engaged communities and active local groups; great transport links; gorgeous architecture; fabulous cafes; and the very real sense of welcome we have been given. The Forest Hill Society could not ask for better outcome for Louise House (located between Forest Hill Library and Forest Hill Pools). The building itself will not only be reinvigorated but crucially, by having a long term lease, the organisation can offer long term support to new and emerging artists in the area. The exhibitions and events that V22 are planning will no doubt have a positive impact on both the community and the local cultural landscape. The Society welcomes V22 wholeheartedly. It should have been part of the swimming pools complex - a dire decision not to incorporate it. This all sounds amazing- I am very hopeful- and can't wait until it is all complete and we can all enjoy the facility.